Every year or so one of our neighbors takes us out for Sunday brunch. She is considerably older than us, a world-traveller, very refined and formal, with a penchant toward opera, classical music, and the British way of doing things. Her stories of long ocean voyages to faraway lands are always fascinating, and we often learn very interesting new tidbits… like today’s revelation that she enjoys watching car racing. Not the "wimpy NASCAR stuff", but Formula 1. Serious enough that she even watches the qualifiers. Our usual destination is the Tea Cozy a few miles up the coast in Cambria. As the name and flag out front suggest, this restaurant continues the formal English tradition of tea and sandwiches. 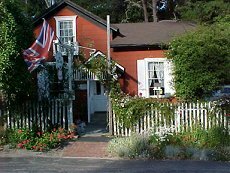 It is in a small converted house, with a hodgepodge of dining rooms and patios, and there’s also a store area where a variety of English products are sold. As usual the brunch was excellent on an unusually warm and sunny coastal day, and I discovered a liking for green earl grey. But I couldn’t help but observe the rather painful traffic flow through the building. Incoming patrons first have to go through a long narrow hallway to the central room, which serves as both the store, cashier, and lobby. The restaurant is busy so there’s always several people waiting to be seated, several people waiting to pay, and some people browsing the selection of Cadbury chocololates, chutneys, tea crackers, and the very large collection of tea cozies. Right smack in the middle of the room is a round display table with barely three or so feet around it, and off to the right is the bustling kitchen. Waitresses are flying in and out of the kitchen going in every direction to get the various dining areas. Everyone must pass by the front of the store/lobby, and go around the table… which is akin to those bloomin’ traffic roundabouts you find in Europe and Boston. Just as with cars, I thought the trick would be to not look at anyone else otherwise they know you’ve seen them and presume you’ll yield. Unfortunately that doesn’t work as well with waitresses carrying trays of scalding hot tea. We had about ten close calls getting seated, and an equal number while paying and leaving. After returning home and waiting for the food to digest, I thought I’d try to see if there was a better way. Although I enjoy fine dining, I really know nothing about the restaurant business, and this is based on only a few visits and no real analysis. If the store and lobby are moved to the front, the kitchen to the east, and a couple of doors moved, it looks like flow could be significantly improved. Of course moving a kitchen is no small ordeal for a slim margin restaurant. However traffic through the narrow hallway and the chance of collision with a waitress balancing hot beverages is significantly reduced. It’s a little bit of a pain to have to walk through the back dining room to get to the back patio, but with the foggy coastal climate the back patio is rarely used. That same environmental nuisance would reduce use of the front patios, thereby almost eliminating traffic throught the front hallway. And the traffic circle round table is toast, so to speak. Nothing like a monument in the middle of your flow. Customers in a restaurant are like parts in a factory. You want the parts to travel the minimum possible distance, you want to avoid collisions with other parts and processes, and you want to enable equipment to interact with the parts in the most efficient way possible. Is your equipment still arranged by process instead of in a cell by product? Are raw materials and subassemblies moved long distances, perhaps even through pedestrian hallways? Do you have traffic circles and other barriers in the middle of your flow? Think about it. Maybe there’s a better way of serving tea. This just show that with a little bit of thought, things can come much easier.